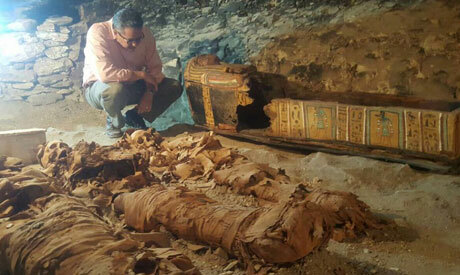 In a gala ceremony held in Draa Abul-Naga necropolis on Luxor's West Bank on Saturday, Minister of Antiquities Khaled El-Enany announced the discovery of an 18th Dynasty tomb of god Amun-Re’s goldsmith, Amenemhat (Kampp 390), and a Middle Kingdom burial shaft for a family. Luxor Governor Mohamed Badr attended the ceremony as well as members of parliament, the Greek and Cypriot ambassadors to Egypt, as well as China's cultural attaché and the Swiss head of mission. The discovery was made by an Egyptian archaeological mission led by Mostafa Waziri. The newly discovered tomb includes an entrance located in the courtyard of another Middle Kingdom tomb, Kampp 150. The entrance leads to a squared chamber where a niche with a duo statue depicting the tomb owner and his wife is found on one end. The statue shows Amenemhat sitting on a high backed chair beside his wife who wears a long dress and wig. Between their legs stands, on a smaller scale, a small figure of one of their sons. Waziri told Ahram Online that the tomb has two burial shafts: the main one for the tomb’s owner and his wife. It is seven metres deep and has a collection of mummies, sarcophagi and funerary masks carved in wood along with a collection of ushabti figurines. The second shaft was uncovered to the left of the tomb’s main chamber and bears a collection of 21st and 22nd dynasty sarcophagi subject to deterioration during the Late Period. In the open courtyard, the mission stumbled upon a collection of Middle Kingdom burial shafts, where a family burial of a woman and her two children was unearthed. It includes of two wooden coffins with mummies and a collection of head-rests. Osteologist Sherine Ahmed Shawqi, who studied the mummies’ bones, explains that early studies on these mummies show that the woman died at the age of 50 and that during her life she was suffering from cavities that led to abscesses in her jaw and a bacterial disease in her bones. 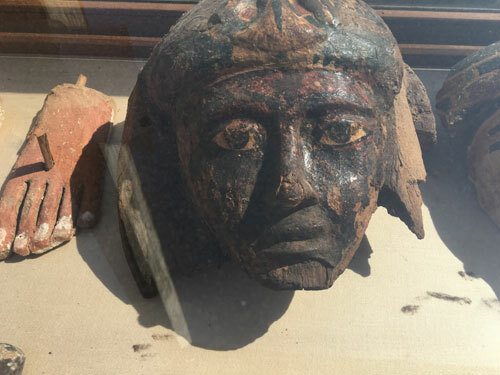 "This woman probably cried extensively as the size of her carbuncular are abnormally enlarged," Shawqi said, adding that inside the coffin the head-rest of the deceased woman was found as well as a group of pottery vessels. Studies on the mummies of her two children show that they were two adult males of age ranging between 20 to 30 years old. Both mummies are in a very good state of conservation with the bones still having mummification liquids. Waziri asserted that one of the male mummies shows that he was suffering from cavities during his life while the second shows that it was probably put later in the same coffin because the bones were bare. 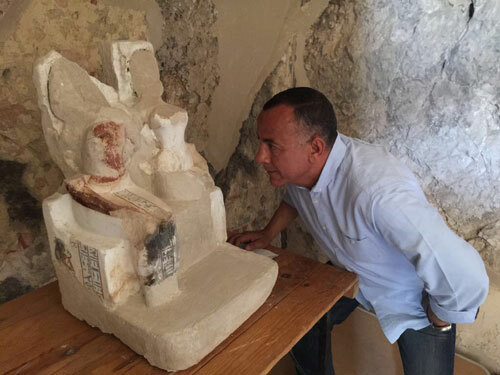 Archaeologist Mohamed Baabash, who is a member of the excavation team, said that during excavations the mission stumbled upon several funerary objects, some of which belong to the tomb owner. 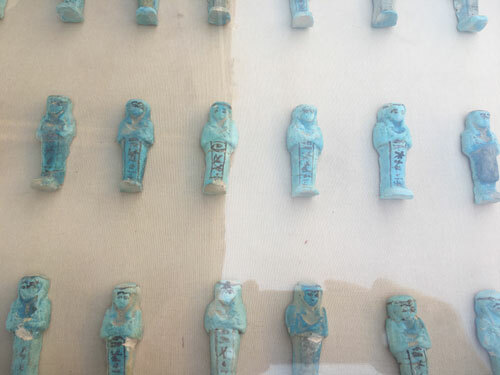 A collection of 150 ushabti figurines carved in faience, wood, burned clay, limestone and mud brick was also unearthed. The mission also unearthed a collection of 50 funerary cones, 40 of which are evidence of the presence of other tombs belonging to four officials. The exact location of the latter has not been yet found. These officials are Maati, Bengy, Rourou and vizier Ptahmes. The other stamps belong to Neb-Amun, the grain harvester and supervisor of Amun's grain storehouses, whose tomb is probably TT145, and Nebsenu, the high priest of Amun whose tomb is probably Kampp 143.